Binturongs have a body length between 61 and 96 cms (24 - 38 inches), a tail length between 56 and 89 cms (22 - 35 inches) and they weigh between 9 and 14 kgs (20 - 31 lbs). Their fur is thick, coarse and black in colour and they have a long, bushy, fully prehensile tail. Their ears are small and rounded and they have tufts of hair on the end. They have small eyes that are reddish/brown in colour. Binturongs are excellent climbers and they can rotate their hind legs backwards so they can still grip onto a tree when climbing down it head first. They have scent glands under their tail and on their feet and they use these and urine to scent mark areas. They have a variety of vocalizations that they use to communicate including howls, grunts and hisses. 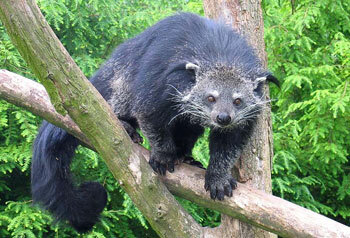 Binturongs can be found in the rainforests of south and south east Asia. They are nocturnal animals and they spend their time up in the rainforest canopy. They are usually solitary but can sometimes be found in small family groups consisting of a female and her young. Binturongs mainly feed on fruit but they will also eat birds, fish, rodents, eggs, invertebrates, leaves, shoots and carrion. 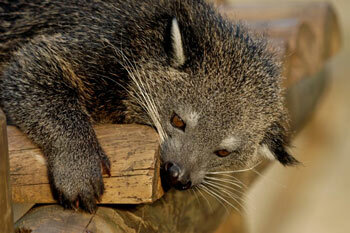 Binturongs do not have a breeding season but most breeding occurs during February, March, April, July and November. After a gestation period of 90 - 92 days, 2 - 3 cubs are born. They remain hidden in their mother's thick fur for a few days and at 6 - 8 weeks old they begin to eat solid food. They reach adult size in one year and females reach sexual maturity at 2 - 3 years of age. Humans are one of the main predators of Binturongs. Binturongs are sometimes kept as pets. Female Binturongs are approximately 20% larger than males. Binturongs are one of only two carnivores that have a prehensile tail, the other is the kinkajou.